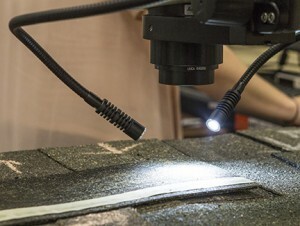 Field studies, including several post-hurricane assessments of asphalt shingle performance, have helped the Insurance Institute for Business & Home Safety (IBHS) shape its laboratory research program on asphalt shingles. The core IBHS research facility is a specially designed, open-jet wind tunnel capable of subjecting full-scale, one-and two-story structures to a variety of wind hazards. Small lab capabilities include a wind tunnel that can reproduce ASTM D 3161 and ASTM D 7158 wind tests and extend test wind speeds up to about 180 mph for ASTM D 3161 and about 110 mph for ASTM D 7158. Additional capabilities include replicating UL (Underwriters Laboratories) 2218 impact tests and impacting specimen with lab-created realistic hailstones. Asphalt shingle research seeks to develop credible relationships between test standards, product ratings and real-world performance in wind and hail events. Through closed-claim, post-disaster investigations, IBHS found roof cover damage to be a factor in more than 95 percent of hurricane wind claims and almost 100 percent of hail damage claims. IBHS roofing research is focused on asphalt shingles because of their large residential market share. Due in part to using improved sealants, a wide variety of asphalt shingles now receive the highest ASTM D 7158 “H” wind rating. However, differences have been observed in real-world hurricane performance of different “H” rated asphalt shingle product lines. It also is clear that wind and hail performance of asphalt shingles tends to decrease as they age. Consequently, IBHS is investigating relationships between current test standards and product ratings during realistic wind and hailstorms. IBHS has performed detailed measurements of steady and unsteady wind loads on shingles using ASTM D 3161 and ASTM D 7158 test protocols and compared resulting uplift forces with those from similar full-scale measurements in its core research facility. Researchers have tested many representative products using ASTM D 3161 and increased wind speeds to assess limits when shingles are well sealed. UL 2218 steel ball drop tests have been replicated on 22 different asphalt shingle products ranging from commodity 3-tab shingles to premium and SBS polymer modified architectural shingles. Future work will retest those same product lines with simulated hailstones created using a mixture of seltzer water and tap water to mimic thunderstorm produced hailstone density and hardness. IBHS also has initiated aging studies where specimens will be exposed for 5, 10, 15 and 20 years to determine how their wind and hail performance changes. At this point in the IBHS research program, it is clear that wind uplift forces on shingles do not depend directly on roof surface pressures. Loss of shingles during strong wind events is as likely to originate in the middle of the roof as along the edges or in the corners where roof uplift pressures are greatest. However, ASTM D 3161 and ASTM D 7158 produce very steady uplift forces as compared with those exerted by turbulent winds that engulf a building during strong winds. The turbulent winds and wind structure interaction produce higher short duration uplift forces for a given gust wind speed at mean roof height than those produced by ASTM test standards running at a constant speed equal to the gust wind speed. For tests conducted at the same wind speed, ASTM D 3161 produces higher uplift forces on shingles than ASTM D 7158. For most shingle products, the key to wind performance is how well the top shingles seal to the shingles below and how well that seal is maintained over time when exposed to the elements. In contrast, there are some indications that increased toughness and flexibility of polymer-modified shingles may allow them to survive a storm even if the seal is broken. It would be a huge win if water doesn’t get into a building when shingles lose their seal and begin to lift. Tougher shingles might also reduce the number of re-roofs needed after a major storm. Twenty-two products, including UL 2218 Class 4 impact-rated (IR) products, subjected to UL 2218 testing at IBHS did not perform very well. In fact, none of the off-the-shelf products tested, basic or IR, passed more than Class 2 impacts without at least one double impact location failing the UL 2218 performance criteria. The following summarizes relative impact performance of different product classes based on the percentages of double impact locations that passed the UL performance criteria – no cracking or tearing observed on the back. • Basic architectural shingles perform slightly better than basic 3-tab shingles. • 3-tab IR and architectural IR products performed better than their corresponding basic products. • IR architectural shingles performed about the same as IR 3-tab shingles, except at Class 4 steel ball impacts, where the performance of 3-tab IR shingles was about 40 percent better than the architectural IR shingles. • Premium architectural shingles performed slightly better than the basic architectural shingles, but not as well as IR architectural shingles. • Polymer modified IR shingles performed better than traditional IR shingles. IBHS is an insurance industry supported non-profit conducting objective, scientific research to identify and promote effective actions that strengthen homes, businesses and communities against natural hazards and other causes of loss. Reinhold is IBHS Senior Vice President for Research and Chief Engineer. Cope is IBHS Vice President for Research at Insurance Institute.